Intensive combat actions were registered along the entire line of contact. One Ukrainian serviceman was killed in combat near Krymske, three were wounded near Avdiyivka and two near Volnovakha on 9 May, according to the press centre of the Joint Forces Operation (JFO). 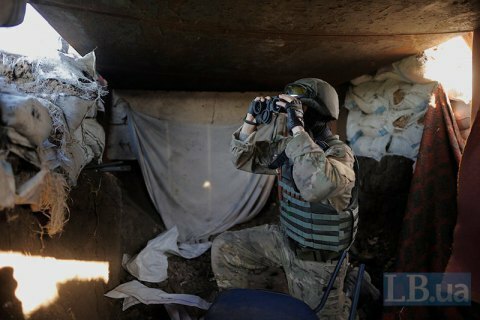 The situation in Donbas remained difficult as intensive combat actions continued along the entire line of contact, it said in a Facebook update. The areas of Avdiyivka, Pisky and Shyrokyne continued to be especially tense. "The Russian occupying troops used artillery and mortars 20 times. On 53 occasions, they targeted our positions with small arms, grenade launchers and infantry fighting vehicle guns. In some area, the occupiers launched active assault effort," the JFO press centre said. "JFO units were engaged in active combat in the Avdiyivka industrial zone, near Pisky, giving an adequate response and destroying the enemy's firearms. According to the intelligence, in the area of Avdiyivka alone, the enemy lost five people killed while seven were wounded," it said. On 10 May, combat engagements continued in the areas close to Donetsk and Mariupol. The Ukrainian army has reported no losses. On the afternoon of 9 May, militants shelled Loskutivka ad Zaytseve, wounding one elderly woman.